Asymmetrical Balance is at the core of all design! Did you know that the fundamental building blocks of life are asymmetrical? Katherine Anne Porter, author of the 1962 novel 'Ship of Fools', had the following wisdom to share about chaos, and the task of an artist or designer. to give them some kind of shape and meaning." We see in the universe, Chaos brought into perfect balance. The entire universe is fueled by the balance between asymmetry and symmetry! You have seen chaotic gardens. They are everywhere on our streets and highways the world over. They are sometimes charmingly chaotic, while at other times they seem a blight upon the earth! 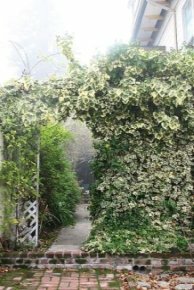 So what is the difference between a romantically unkempt secret garden and a chaotic and wild garden? 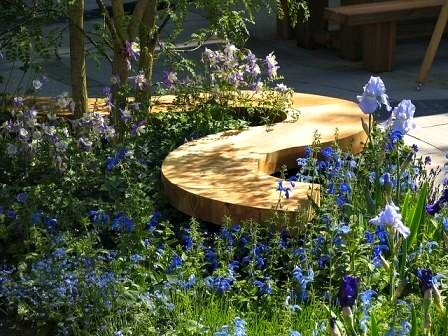 When we miss the mark in creating a sense of symmetrical or asymmetrical balance in our gardens, chaos is the result! Well kept or unkempt, the difference is obvious. I have used the two photos here to illustrate a point. 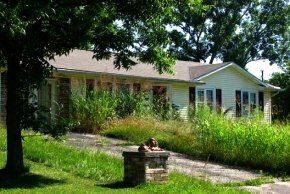 Both gardens are somewhat unkempt. But one is charming, the other is just ugly. What is the difference? the overall composition, helping keep this somewhat overgrown ivy specimen in sync with the rest of the garden. Our challenge, when faced with a garden that does not lend itself to the use of perfect symmetry, is to balance the basic building blocks such as our homes, fences, plants and garden furnishings so that they take advantage of the principle of asymmetry to create balance. 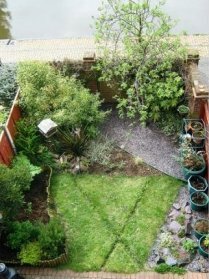 Once that balance is achieved, it is much more difficult to fail to create a unified, charming garden space. A good designer creates harmony out of chaos! Nothing more, nothing less. So how do YOU develop that knack? All you need do is become comfortable with the elements and principles of design. One of the foremost principles of design is this concept of asymmetry. Asymmetry is defined by its antonym, symmetry. The English word symmetry is derived from the Greek word symmetrio which means “of like measure”, and the Greek word metron, which means “measure”. The word symmetry then, means “of like measure”. Symmetry is typically used in the English language to describe a mirror image. One side of a vertical axis drawn down the center of a composition would net equal, but opposite images. The word asymmetry means without symmetry, or "not a mirror image". 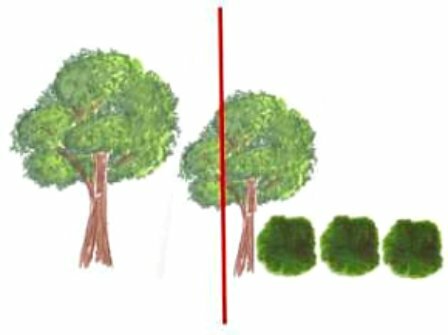 The following drawing depicts one way to create an asymmetrical balance within a garden composition, through shape and form. However, there are many different ways to create asymmetrical balance. How then, do we create asymmetrical balance in a composition? 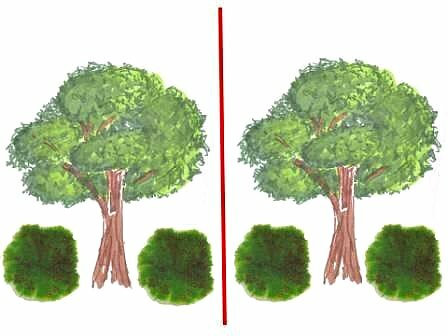 Following are some examples of these techniques - shown first in a public domain art example, and then subsequently shown is a similarly treated garden space. 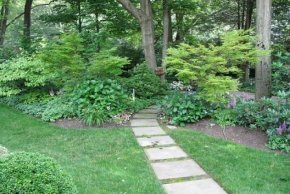 I hope that through these examples you will begin to get a glimpse of how these techniques can help you create an asymmetrical balance in your own gardens. Placement of objects in a composition is one way of creating an asymmetrical balance. toward the back of the room, in front of a large mirror, while the spectators are positioned toward the bottom right, larger, and facing toward the dancers. This creates a balance based upon line and position. Here is a garden that is asymmetrically balanced using similar principles. The layout of the garden juxtaposes larger and smaller elements that have been arranged to create an asymmetrical balance using line and position to visually equalize the spaces. As you can easily see, while this garden has very dissimilar elements, its overall composition is balanced, thus ensuring that disparate elements all work together to create a pleasing garden space. Varying color and color values is another way of creating an asymmetrically balanced composition. 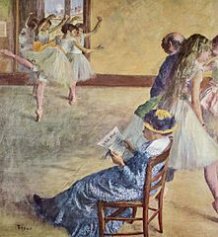 bottom of the painting, and also up to the right of the center of the composition, with the bright white skirt of the dancer and a red scarf presenting a stark contrast to the background. 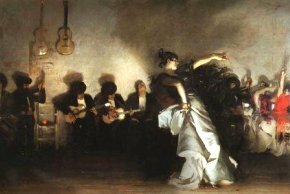 The larger lighter spaces along the top of the painting provide a balance to the strong white of the dancers’ skirt. In the rock garden presented to the right, similar elements are at work. The neutral, but heavy tones of the grey stone and miniature castle are balanced by the brighter and more vibrant hues of the flowers in the garden. As you can see, the overall effect is a unified, but asymmetrically balanced composition. On this garden wall, we see a very similar treatment which creates a fetching view. We see again the same strong line of the wall as a horizontal element, and the climbing rose further strengthens that horizontal influence. The strongly colored gate and the columnar tree behind the wall and to the left of the photo provide a vertical element which balances the horizontal lines. Shape and form can be balanced similarly to create an asymmetrical balance in the garden. A very dark vertical shape is created by the silhouette of a woman in this graphic composition and splashes of color also presented vertically to the left side of the composition create a balance to the strong darker green line of the stage upon which she stands. Leading lines may also be used to help balance out a composition. from the public domain. 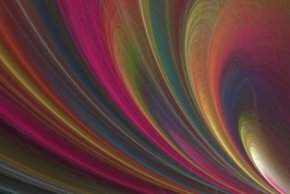 The curved lines in this image, (aided by color values) create an asymmetrically balanced image. leading lines that enable an asymmetrical balance in this composition. Without these leading lines, the composition would suffer, even though similar forms and shapes have been used in the planting. The inclusion of these lines that lead the eye vastly improve the composition, turning the garden path into a truly delightful and inviting element of the design. 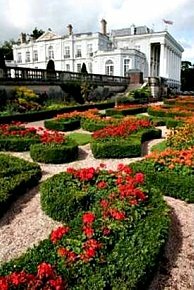 This lovely parterre garden uses similar techniques. The curved lines of the finely textured hedges create a pattern against crushed stone surfaces, while the brightly textured flowers create a strong unity throughout the garden. The hedges in this garden are not identical as they would be in most parterre gardens, but rather are nearly free-form swirls and squiggles that create a strong interest and form an asymmetrically balanced picture. Texture and Pattern can be used to aid in creating an asymmetrical balance in the garden. 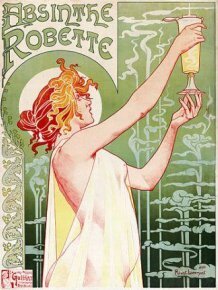 A central figure of a woman with a martini glass dominates the image. However, she is placed to the left of the image and is facing the right side of the image. This creates an imbalance in the image that is countered by the use of texture. The strongly horizontal pattern to the right of the image balances the woman’s shape, while the more strongly rendered words at the top left help to balance those horizontal lines across the remainder of the image. The use of multiple smaller gardens unified by texture and color enable this asymmetrical garden to maintain a formal, yet exciting visual experience. These techniques to help you create asymmetrical balance in your garden have infinite variations. The juxtaposition of garden elements against the forms, shapes, colors, textures, lines and position of other garden objects make for a never ending stream of possibilities. 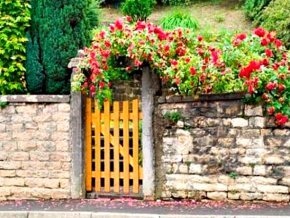 These ideas are your ticket out of the chaotic jumble that makes up so many garden areas. If you plan with the principles of visual balance, using symmetrical and asymmetrical balance together to create equilibrium in the garden, it will provide you with freedom to experiment with just about any other element and yet always maintain the unity required for a garden to be pleasing. 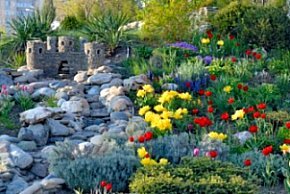 Understand the principle of visual balance, and you have won half of the battle in creating an artistic garden that will allow for variety, while maintaining a unified appearance. If you have entered on this page, you may want to visit the visual balance and symmetrical balance pages to get the rest of the story! You have the major element in hand with what you learn on these three pages. The rest is gravy!